We've talked about the X58A-UD9 board a fair bit in our blog. 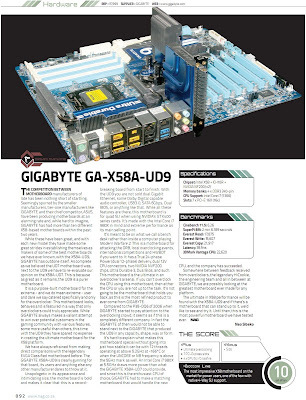 It's a board that is clearly impressing overclockers, powerusers and editors all around the globe. I thought I should show one such example from a well known South African publication having a look at UD9. Somewhere between feedback received from overclockers, the legendary HiCookie, the engineering team and all in between at GIGABYTE, we are possibly looking at the greatest motherboard ever made for any platform. The ultimate in X58 performance will be found with the X58A-UD9 and if there’s a motherboard that can stand up to it, we’d like to see and try it. Until then, this is the most powerful motherboard we have tested ever.